Good Afternoon! It's a perfect one here in Red Bulls Land. Our team is back in League action @The Cathedral of Football against midwest powerhouse Sporting Kansas City (preview here). A massive, massive fixture and, as a home game, it's a must-win for the Red Bulls. Kansas City is coming off a tough 3-2 loss @New England and, at the moment, have a poor 1 win, 1 tie, 3 loss League record. In their preview this week, the boys over at Seeing Red correctly described KC as having the best offense in the league but, at the same time, the worst defense. They have 10 goals in 5 League games, but have given up 12 in the same stretch. Needless to say, KC will be looking to add another game to their win column. 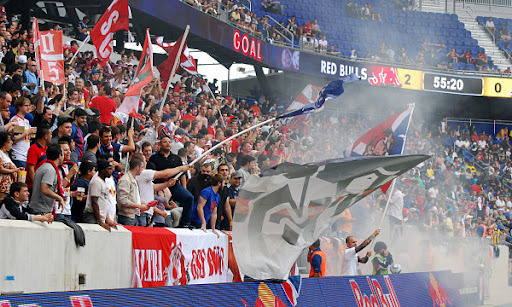 The Red Bulls, on the other hand, are coming off a stunning 4-0 drubbing of DC United @RFK Stadium. In the last two games, our team has scored 7 goals (3 of them against San Jose) and given up none. It seems like the dormant offense (2 goals in the first 3 games) has finally come alive. Also, it's Mike Petke Day, so the Red Bulls will, no doubt, aspire to honor Big Mike with a pounding of SKC. With all that in mind, let's get to some predictions! OK I'm done with the negative predictions - for now anyway. The Red Bulls are scoring goals in bunches, the strikers are working well together and everything seems to be ticking along beautifully. Meanwhile KC has a horrid defense and is the middle of a massive road trip to start the season. I can't see anything but a Red Bulls win here. 3-1 to RBNY withy goals from Richards, DeRo and Henry. I'm going to agree with Matt and go with a Red Bulls win. I'm going to go conservative, however, and say that it will be a 2-0 Red Bulls victory, with Dwayne DeRosario (hopefully) opening his goal-scoring account today. This week's contest can be predicted using basic mathematical progressions. Two matches ago, the score was 3-0; last week, 4-0. So obviously, this week it will be 5-0 to the Red Bulls. Our midfield and overlapping backs are going to shred Sporting KC's 3-man midfield and the league's most porous defense will fare worse than San Jose or D.C. Meanwhile, our solid back line and Bouna's rediscovered confidence will stifle the three prongs of the SporKC attack. Rodgers with 2, Henry 2, DeRo 1. 5 assists from Solli & Richards. Until the pattern changes, I'm not changing anything. This season if I've predicted a Red Bulls win, they've lost, and vise versa. I would kick myself if I went with my hopes and gut instinct of a victory against Sporting KC, only for it to backfire. We really, really should win this. Two games, two wins, two shutouts and seven goals, heading into a match against the bottom team. There are no excuses; to be considered one of the league's best teams, we need to beat sides like this. But for the sake of reverse psychology, I'm sitting on the fence with a 2-2 draw. But if we can score more than that, or KC less, I'll be ecstatic with three consecutive wins! I'm betting our good run continues. We're @The Cathedral facing a Kansas City team with, maybe, the worst defense in the League. We've scored 7 goals in the last two games, without conceding even one. I'm going with a 4-0 RBNY drubbing of KC. Well there you have it! According to at least three of us, it will be an RBNY goleada today. We'll have our award winning coverage within the next few days. Hope to see you all @The Cathedral of Football, Red Bull Arena (built by Makita). Viper Out!